It’s September 13, 2004. In the U.S. on this date, the Clinton fake “assault weapon” ban sunsets. 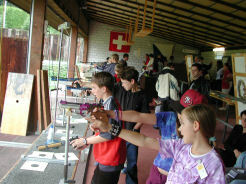 In Zurich, some 5,631 teens  4,046 boys and 1,585 girls, aged 13-17  have finished firing the Swiss service rifle, and it’s time for the shootoff. That rifle is the SIG Strumgeweher (assault rifle) model 1990 (Stgw 90), a selective fire, 5.6 mm rifle with folding skeleton stock, bayonet lug, bipod, and grenade launcher. The Stgw 90 is a real assault rifle in that it is fully automatic, although that feature is disabled during the competition. Every Swiss man, on reaching age 20, is issued one to keep at home. Imagine all those teenagers firing this real assault rifle while their moms and dads look on with approval, anxiously awaiting the scores. 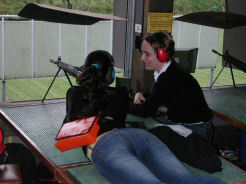 The Knabenschiessen takes place at the Albisgütli shooting range, located in a residential section of Zurich going up toward the Uetliberg mountain. Noise is not a problem  the tram that stops there is louder. When in Zurich, I run on the Uetliberg paths, and find the sound of rifle fire (at times combined with cow bells) melodic. The Boss: Girl instructs air pistol, ages 8 and up. Indeed, you might hear rifle fire just about anywhere in Switzerland. Just before the Knabenschiessen, I ran the Jungfrau Marathon. It was “march or die,” straight up to the Eiger Glacier (featured in the movie The Eiger Sanction). Half way up, I heard the pleasant sound of rifle fire. What did the runners from Japan, where guns are banned, think? The day after the race, I took the rail to Zurich to observe the second and third days of the Knabenschiessen. I met up with my old friend Fritz Rudolf, editor of Schiessen Schweiz (the Swiss Shooting Newspaper), the official organ of what could be called the Swiss NRA. We talked to some of the competitors and their parents, who were invariably proud of their young shooters. These children have no idea of how unique is their freedom, in today’s world, to participate in such shooting activities. The rifle range for the firearm competition is 300 meters and has 62 targets. This is the standard distance for all Swiss military rifle competitions. Kids aged 13 and up are not exempted from this long-distance sharpshooter regimen. To the right of each shooter is a digital image which shows exactly where each shot hit on the target. Attached at the ejection port of each rifle is a shell catcher. The score card: Father and son. A coach is assigned to each position where one after another shooter competes. The iron sights are set for 300 meters at factory settings and are not adjusted during the entire competition. After each shot, the coach uses a clear plastic sheet picturing the rifle sights  the vertical post and the ring  with a dot showing competitors where they hit. The only adjustment is by Kentucky windage. The shooting positions are in a long building with garage-like doors that open and close. 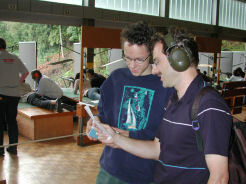 The rifle range is on the upper level, and a pistol range on the lower level, with 25 and 50 meter targets. That explains why, at the Knabenschiessen, each youngster gets only five shots. And there are no practice shots. Of course, a great number of the competitors are expert “markschildren,” undergoing regular, rigorous training. Scoring is on a bullseye target with the center counting six points. An extra point is awarded for each shot which hits the target  so each shot actually has a maximum value of 6 + 1. With five shots, the perfect score is 35. All shooting is in prone position. This girl, one of 1,585 who competed, is being coached in sharpshooting with the Assault Rifle 90, the Swiss service rifle. That brings us to September 13, the day of the shootoff between the only three competitors who shot a perfect score of 35. (There was also a shootoff for the 16 who shot a score of 34.) The competitors were on the firing line with an enormous crowd behind them. TV and newspaper reporters milled around. An exploded electronic image showed spectators where each shot hit on a simulated target. The crowd was on edge as electronic bullet holes began to appear on the screen. Miss just one point, and that could knock you out. Fabienne Frey, a 13-year old girl, shot a 6, but her next shot was a 5. Her opponents were two boys who were firing a little faster. Carlo Ammann (age 15) finished with three 6s and two 5s, for a total (with the extra point for each hit) of 33. The other lad was a point behind him. Meanwhile, Fabienne was taking her time. Her third shot was a 6, as was her fourth shot. Everything rode on her last shot. There was total silence from the crowd, she fired, and a great cheer erupted  a 6, giving her a total of 34 points. 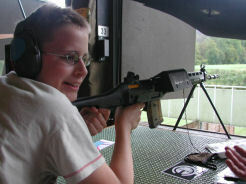 This cute, petite 13-year old blonde with braces became the Schützenkönigin  the Shooting Queen. Carlo got second place, becoming the Bester Knabe (top boy shooter). In most years, the winner is a Schützenkönig  Shooting King. However, females at all ages are excelling in rifle and pistol competition. In the year 2000, in the Swiss Federal Shooting Festival held once every five years  the largest rifle competition in the world  a woman won first place in the military rifle competition, beating out all the males who serve in the Swiss militia army. Politicians rushed to congratulate Fabienne and the other winners, knowing that their handshakes would be on the evening’s news. The interviews revealed her to be, when not in school, an expert crossbow enthusiast. Not a surprise in the land of William Tell. 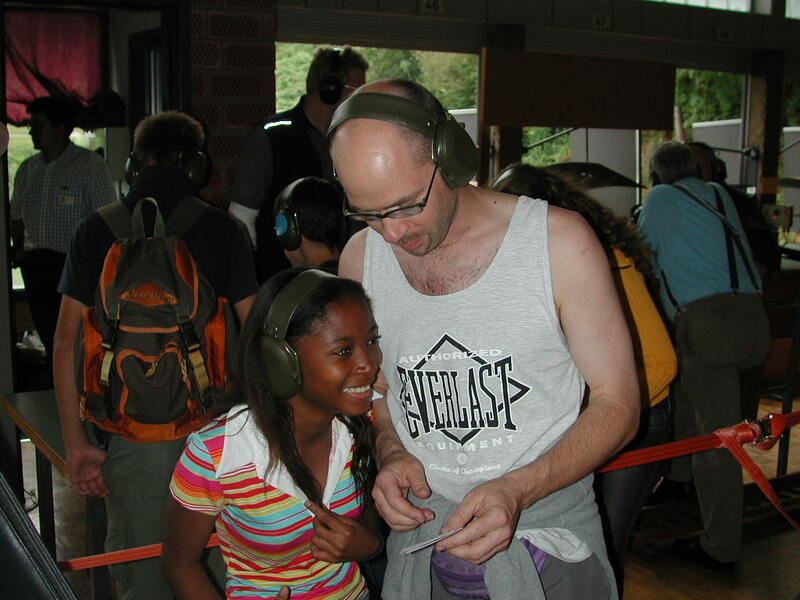 The score card: Father and daughter, Swiss diversity. Next came an enormous banquet to honor the competitors in all categories  the best shooter by age group, the best school class, and others. 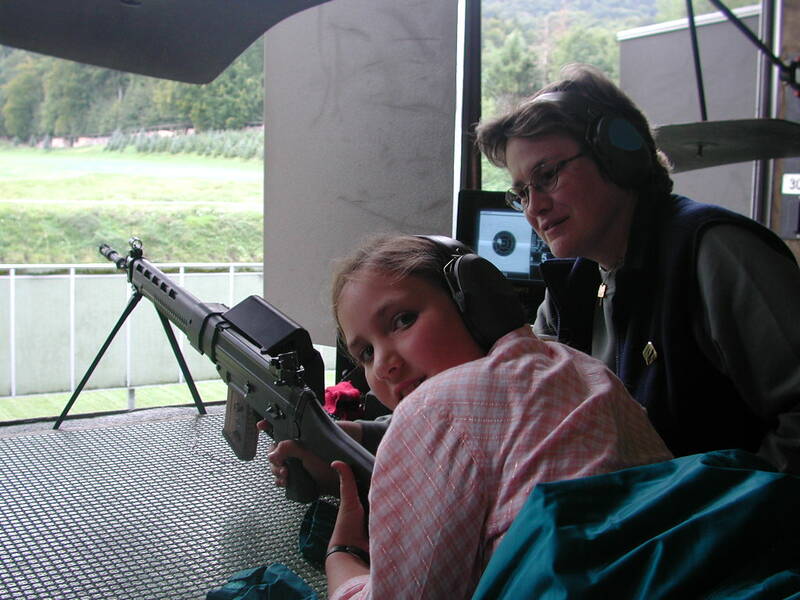 Zurich Mayor Elmar Ledergerber said in his speech that “the Knabenschiessen is for the young, the younger, and the youngest.” Indeed, as noted, 8-year olds shoot air gun, and 13 and up shoot military rifles. The Mayor is a member of the Socialist Party, but being on the left does not necessarily entail being anti-gun. A few years ago, the socialist fringe wanted to ban the Knabenschiessen, but the proposal was promptly shot down. Last year Switzerland’s Minister of Justice was voted out of office after proposing firearm registration. Switzerland stands alone in Europe with her free market economy and respect for firearm ownership, and citizens vote accordingly. The program for the event, a booklet, depicts on its cover the caricature of a young girl winking her eye  an enticement for kids to come to the shoot. Besides greetings from politicians and event officials, advertising by banks, airlines, and major businesses wish the competitors “guet Schuss”  good shooting. The Knabenschiessen is the greatest festival of the year in Zurich, followed by the Sechseläuten (Spring festival) and Fasnacht (Mardi Gras). 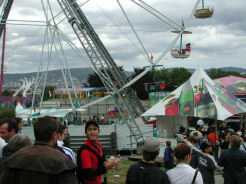 While the shooting competition is the focus, the festival includes an enormous carnival, with acres of ferris wheels, bumper cars, and all manner of wild, turn upside down rides that only teens would venture. 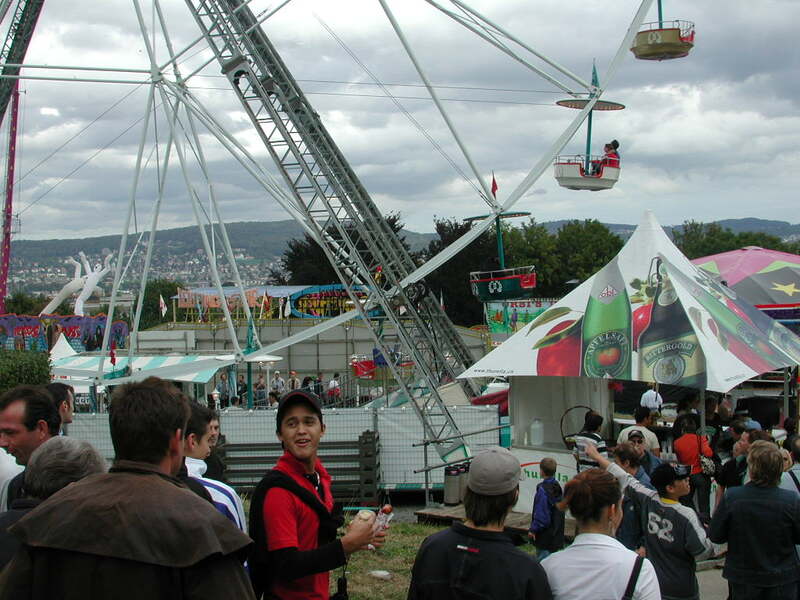 One ride zooms dozens of thrill seekers strapped on a circular seating device up an enormous vertical pole, then drops them down, only to stop just before it would crash onto the ground. Ready to shop: red purse reveals what’s up after the five shots for score. “Radical pacifists would probably rather miss out on the Knabenschiessen,” warns an internet site on upcoming Zurich events, but adds “don’t be afraid of armed teenagers” and come and see “a good chunk of Swiss tradition.” For the official site, visit http://www.knabenschiessen.ch, and treat yourself to techno music blended with gunshots, images of flying saucers and space aliens, and the admonition “Nicht verpassen” (don’t miss it)  you know, stuff that appeals to kids. The Knabenschiessen has been held every year except in 1939. Just days before the scheduled event, Hitler started World War II. All Swiss men grabbed their rifles from home and mobilized to prevent a Nazi invasion. Youngsters and old men were organized into the Local Defense, bringing their own rifles or getting them from the military. At each Knabenschiessen for the next five years and until the war ended, Switzerland was surrounded by the Axis powers, giving the youngsters a special incentive to practice their shooting skills. General Henri Guisan, commander in chief of the Swiss militia army, would appear at the wartime matches and inspire the spirit of resistance. One such lad was Rolf Siegenthaler, who I was privileged to meet at the 2004 Knabenschiessen. He later would command a division of mountain troops, and eventually became head of the Zurich Shooting Association (Schützengesellschaft der Stadt Zürich), which sponsors the Knabenschiessen. One of the 4,046 boy competitors. Notice the shell catcher over the ejection port, left hand gripping the lower portion of skeleton shoulder stock, and sight instruction sheet on floor. In the morning after the Knabenschiessen, a picture of young Fabienne flanked by Zurich politicians appeared in Neue Zürcher Zeitung, Switzerland’s most important newspaper. Another paper, the Tages Anzeiger, featured Fabienne in color on the front page. Zurich’s youngsters who shoot military rifles have a lesson to teach Americans. It is a lesson of peace, family values, and responsibility, while gaining the ability to defend oneself and one’s community from aggression. 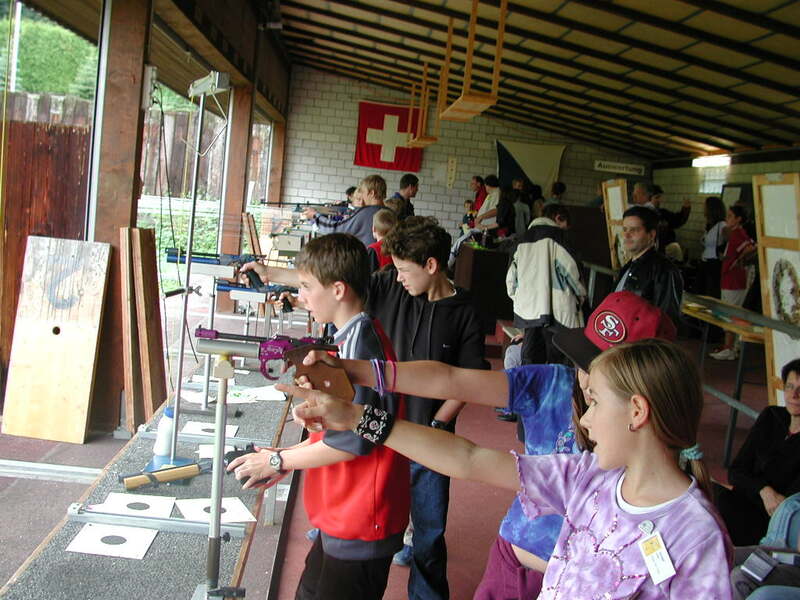 As was well known to America’s Founders, who were enamored of the Swiss model, teaching the young to shoot is both a civic virtue and a wonderful sport.